People described it as, “pretty rough,” and, “hard to watch.” Some said they couldn’t watch it at all. But their words did not dissuade me, instead, compelled me, because I don’t want to forget our history and its legacy, don’t want to avert my eyes from the sorry truth, even if knowing it, seeing it, might be painful. I reclined on the futon and powered through my salad while skipping through the previews, wanted to avoid eating during the film. I’d braced myself for, 12 Years a Slave, knowing it would hurt to watch, yet mindful that my hurt would amount to a speck of salt in a sea of misery that was slavery. For over two hours I buckled and wept and cringed while Calvin slept peacefully in the room next door. Though I long for the day when Hollywood produces fewer films about black oppression and more about their triumphs (minus the storied white savior, please—and I'm not referring to Jesus) the film is good, ambitious, important. It is essential in its historic account, its black biographical perspective, of a despicable institution for which some still unabashedly wave their flags today. I must admit, however, wondering if the film's raw violence inadvertently serves to sate the sadistic fetishes of some. An upsetting account, the film incited anger and shame for all the hateful things that mankind is willing to do in the name of prejudice, avarice and clout, such as the vile decrees that the favored, self-righteous pressed onto the masses, to which the greedy, ignorant, cowardly, and bigoted were complicit. 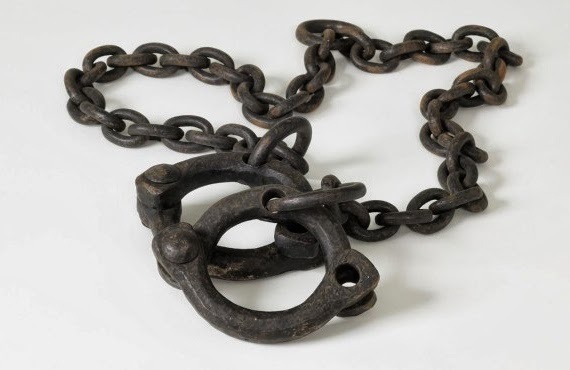 I contemplate the shackles of slavery, its heinous laws, its vicious crimes, the craze for power, profit and tyranny, and the employment of whips, chains, muzzles, ropes and guns on innocent human beings. I lament the fact that certain Americans still find themselves at the wrong end of a barrel through no fault of their own. I consider the film’s depiction of atrocities—of children torn from their mothers, of men cuffed, thrown into cells and flogged, of women raped, beaten and mutilated, of youths tortured for having the "wrong" color skin, for challenging authority, for defending themselves, of families splintered, workers exploited, innocents lynched, of decent, moral people being shamed, blamed, trodden upon and wronged—and I think to myself how things haven't much changed in the hearts, minds, fists and attitudes of some dyed-in-the-wool, mostly white men, and their followers, who continue to shape policy, enforce laws, issue verdicts and impose penalties on people for whom they feel contempt. "Most are Negroes, Hispanics, Filipinos and entertainers. Their Satanic music, jazz and swing result from marijuana use. This marijuana causes white women to seek sexual relations with Negroes, entertainers and any others." “Reefer makes darkies think they're as good as white men." Even today, black people are nearly four times as likely as whites to be arrested on charges of marijuana possession—in some states six times as likely—despite data suggesting they use the drug at about the same rate as whites. Moreover, black incarceration rates handily outpace the rates of their white counterparts, their sentences often quite harsh compared with their offense. The institution of slavery, which made white plantation owners and others rich, has morphed into the mass incarceration of our black countrymen, while the prison-industrial complex gains billions in revenue. When the movie was over I sat quietly in the dark listening to the music as the credits rolled by. I heard Calvin rustling in his bed and wondered how I'd feel if my child were ripped away by strangers. I tried to imagine what it would be like, if I were Native or African American—or other minority—to have my homeland seized, my tribe obliterated, my culture, language and religion crushed, my village torched, my family torn apart, my daughter sold into slavery, my sister burned alive in a church, my brother thrashing at the end of a fire hose or a noose, my leader assassinated for advocating on behalf of truth and justice, my teenager murdered by a racist menace while minding his own business, my husband's life snuffed out beneath the knees of a uniformed mob, my assailant acquitted because he is white, my mother imprisoned for trying to improve my education. I go further and imagine my brother being beaten and left for dead because he was gay, my sister raped by a commanding officer whose cronies ensure he gets off the hook, my body bruised or burned or urinated on because I am homeless, my virtue, commitment and drive constantly questioned because I need food stamps, my rights withheld because of who I love, my vote, my wage, my education, my safety, my chance at promotion impinged on just because of who I am or what I look like. Luckily, I don't know exactly how it would feel if these injustices happened to me. But I do know, for millions in America—a country that is proudly touted by some as the greatest nation on earth—daily life is rough and painful, scary and dispiriting, unjust and seemingly hopeless. I see evidence on the news and in the papers. I hear slurs on the street and in nasty Facebook posts and at times from the mouths of people who are close to me. Sometimes it's blatant, others, insidious. No matter, it's hard to witness, much less live. But watch I will, though not in silence, and never will I be unmoved. You have a gift of language, Christy. And you always make me think. A very moving plea. Thank you for that, Christy, and for the information about Anslinger about whom I had known nothing before.